There are many candlestick patterns but only a few are actually worth knowing. 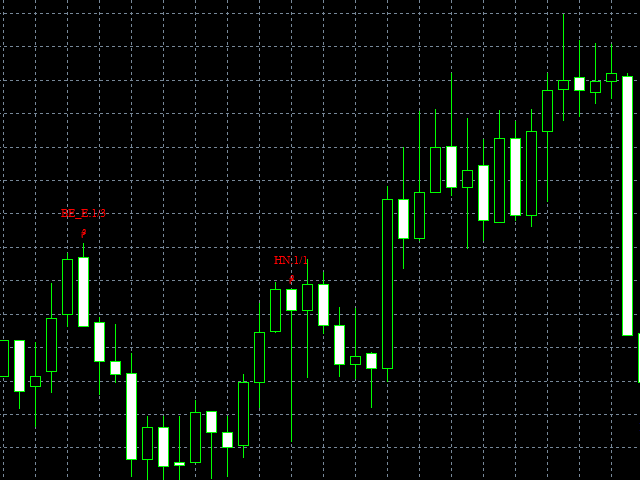 Candlestick Pattern Filter detects and marks the most reliable candlestick patterns. Remember that these patterns are only useful when you understand what is happening in each pattern. They should be combined with other forms of technical analysis for best result. High accuracy: The accuracy has been improved by tuning process. We have a set of input parameters for each pattern and adjust input parameters to get the best result. For example: BU_E.2/3 means Bullish Engulf pattern with accurate score is 2, and maximum additional score of Bullish Engulf pattern is 3. Let user tuning accuracy of candlestick patterns by parameter. Added function to send notifications via email. Added function to send notifications via SMS. Re-named and grouped old parameters by each candlestick pattern. It is easier to understand and use them. DisplayLegend: true/false: To show/hide legend at the top-left corner of chart screen. SampleSize: Number of history bars those are used to calculate typical size( average of body length, upper shadow, lower shadow) of a candlestick at current time. Group of parameters for Hammer pattern. Hammer_Label: label for Hammer pattern, default value is "HR". Hammer_Color: color of Hammer label, default value is Blue. Hammer_DisplayLabel: to display label for Hammer pattern or not, default is True. Hammer_ShowAlert: to show alert dialog for Hammer pattern or not, default is True. Hammer_SendMail: to send email for Hammer pattern or not, default is False. Hammer_SendSMS: to send SMS for Hammer pattern or not, default is False. Group of parameters for Inverted Hammer pattern. InvertedHammer_Label: label for Inverted Hammer pattern, default value is "IH". InvertedHammer_Color: color of Inverted Hammer label, default value is White. InvertedHammer_DisplayLabel: to display label for Inverted Hammer pattern or not, default is True. InvertedHammer_ShowAlert: to show alert dialog for Inverted Hammer pattern or not, default is True. InvertedHammer_SendMail: to send email for Inverted Hammer pattern or not, default is False. InvertedHammer_SendSMS: to send SMS for Inverted Hammer pattern or not, default is False. Group of parameters for Hanging Man pattern. HangingMan_Label: label for Hanging Man pattern, default value is "HN". HangingMan_Color: color of Hanging Man label, default value is Red. HangingMan_DisplayLabel: to display label for Hanging Man pattern or not, default is True. HangingMan_ShowAlert: to show alert dialog for Hanging Man pattern or not, default is True. HangingMan_SendMail: to send email for Hanging Man pattern or not, default is False. HangingMan_SendSMS: to send SMS for Hanging Man pattern or not, default is False. Group of parameters for Shooting Star pattern. ShootingStar_Label: label for Shooting Star pattern, default value is "SS". ShootingStar_Color: color of Shooting Star label, default value is Red. ShootingStar_DisplayLabel: to display label for Shooting Star pattern or not, default is True. ShootingStar_ShowAlert: to show alert dialog for Shooting Star pattern or not, default is True. ShootingStar_SendMail: to send email for Shooting Star pattern or not, default is False. ShootingStar_SendSMS: to send SMS for Shooting Star pattern or not, default is False. Group of parameters for Bullish Engulf pattern. BullishEngulf_Label: label for Bullish Engulf pattern, default value is "BU_E". BullishEngulf_Color: color of Bullish Engulf label, default value is White. BullishEngulf_DisplayLabel: to display label for Bullish Engulf pattern or not, default is True. BullishEngulf_ShowAlert: to show alert dialog for Bullish Engulf pattern or not, default is True. BullishEngulf_SendMail: to send email for Bullish Engulf pattern or not, default is False. BullishEngulf_SendSMS: to send SMS for Bullish Engulf pattern or not, default is False. Group of parameters for Evening Star patterns. EveningStar_Label: label for Evening Star pattern, default value is "E_S". EveningStar_Color: color of Evening Star label, default value is Red. EveningStar_DisplayLabel: to display label for Evening Star pattern or not, default is True. EveningStar_ShowAlert: to show alert dialog for Evening Star pattern or not, default is True. EveningStar_SendMail: to send email for Evening Star pattern or not, default is False. EveningStar_SendSMS: to send SMS for Evening Star pattern or not, default is False. 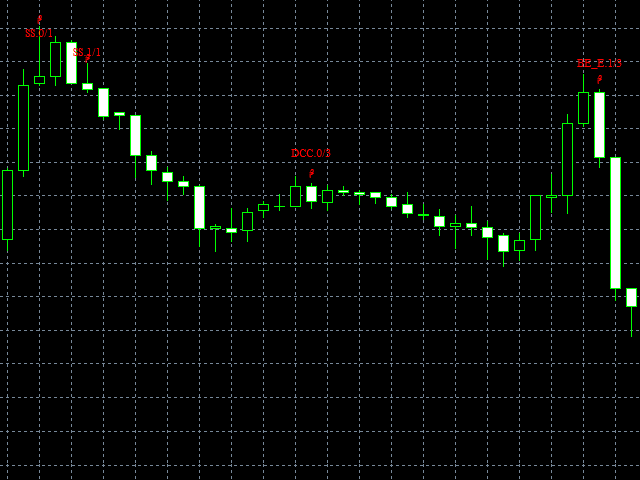 - Added new parameter for tuning and improving accuracy of candlestick patterns. - Renamed and re-arranged existing parameters so that they are easier to use. - Added the functions for sending emails and SMS messages.